Robert's commitment to Revolutionary principles now seems clear. Despite his dangerous ties with the Crown and the nobility, he consistently refused to emigrate, and in 1791 declined the offer from Catherine the Great of a safe haven in the Russian Court. In 1793 he was admitted into the Revolutionary Commune Générale des Arts. He stoically endured imprisonment between 29th October 1793 and 5th August 1794. Although he avoided public office, he was involved in the work of transforming the Grande Galerie of the Louvre into a public museum. This project was begun before 1789, but Robert saw it as an essentially Revolutionary endeavour. 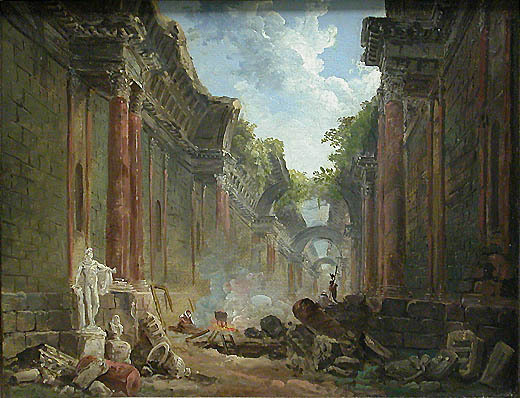 It obsessed him; he painted the gallery at least ten times between 1789 and 1799, including his famous depiction of it in a imagined future state of ruin. His depictions of the Revolution rework the themes of official iconography and can legitimately be read as straightforward commemorations of Revolutionary events. 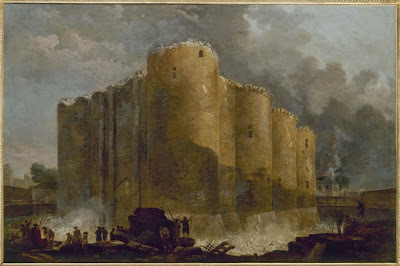 In the Salon of 1789 Robert exhibited a small canvas depicting the demolition of the Bastille. Pierre Demachy later painted the same theme. The heightened scale of the building exaggerates its impact. The onlookers in the foreground are passive observers of change rather than active participants. The picture excited little comment at the time - it was praised for its veracity by one reviewer but criticised by another as too "agreeable", that is it conformed too closely to the conventional rules of the picturesque to give justice to the full horror of the Bastille. 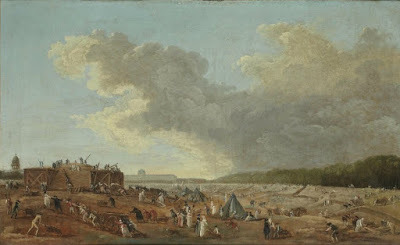 Robert's painting of the Fête de la Fédération of 1790, now at Versailles, hung in the salon of La Fayette's château de Lagrange and was possibly commissioned by him. 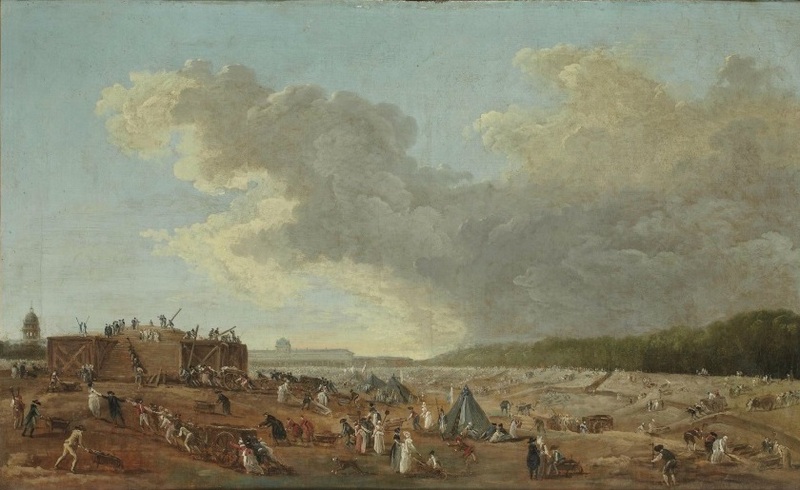 In 2012 a second version was sold at auction together with a pendant La journée des brouettes (the Day of the Wheelbarrows) which depicts Parisians spontaneously coming to the assistance of workers who are preparing the Champ-de-Mars. Both occasions were key elements in official Revolutionary iconography. 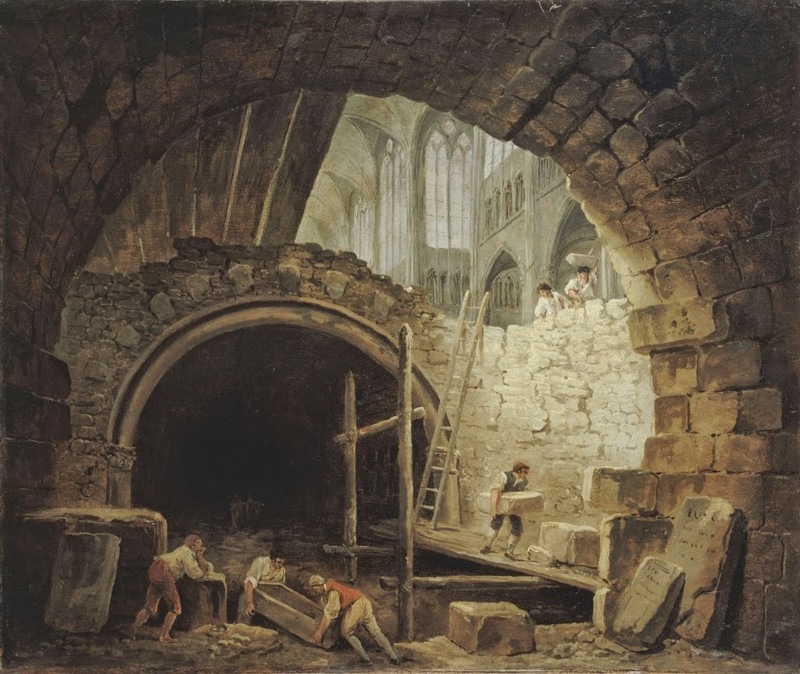 Of all Robert's Revolutionary paintings, this depiction of the dismemberment of the royal crypt is the hardest to accept - surely the artist, with his love of antiquity, must have regretted such an act of vandalism? 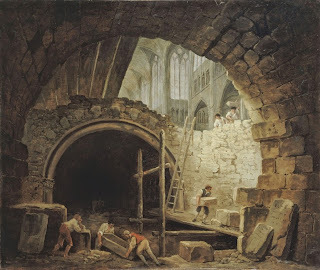 If so, there is nothing in the picture itself to really suggest this; the busy workmen merely go about their task or contemplate the scene tranquilly, with the vaults of the ancient basilica soaring impressively above them. "Despite the stated aims of the exhibition, first to ascertain whether the Revolution effected both a break in the painter's career and a dislocation in his work (p.11) and second to judge the qualitative effect of this caesura (p.27) the interpretative enterprise is often compromised by the organisers' obvious confusion faced with pictures seemingly empty of partisanship (p.25), yet executed by an artist who had invested in the ancien régime more deeply than most (p.20). The apparent absence of a coherent and conspicuous ideology in Robert's work leads Boulot to treat many of his images...as transparent and neutral evidence of little more than anecdotal value (p.79, nos. 20, 25)". 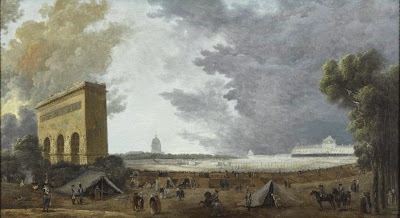 "Radisich’s excellent book concludes with a thoughtful coda titled “Hubert Robert and the Revolution.” Its brevity leaves the reader a bit disappointed and wanting to know more, although it is undeniably another book project in and of itself. Centered on Robert’s incarceration during the last days of the Terror, Radisich points to this uncertain period as profoundly reformative, in the artistic and psychological sense, for the last years of Robert’s professional activity. The enigmatic Young Girls Dancing around an Obelisk painted in 1798, along with the celebrated Grand Gallery of the Louvre pendants, are identified as political and cultural metaphors of alienation and ambiguity, and the author rightly declines to discuss them in specific terms. Still, these works resonate with a sense of catastrophic devastation that must visualize the profoundly troubled state of mind the disintegration of the Enlightenment posed to an artist of Hubert Robert’s sensibilities. Radisich sagely concludes that the ruin of the cosmopolitan, cultivated and civilized world of the Enlightenment is proclaimed in Young Girls Dancing around an Obelisk. Possibly inspired by Bonaparte’s imperialist ambitions in Egypt, the new world order of Napoleonic nationalism and military adventurism are not far behind." "Two rediscovered paintings by Hubert Robert and their French Revolutionary context"
According to Baumgartner Robert was "not a simple witness of the Revolution but a critical commentator on revolutionary events, conscious of the ideals of 1790 and anxious to transmit them.